VeryPDF PCL to Any Converter Shell converts LaserJet PCL print files to PDF files. 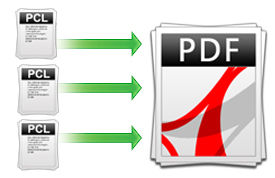 Pcl2pdf quickly converts PCL print files to concise, industry standard PDF. This is not a raster based conversion. Use command line versions in batch and unattended operations. VeryPDF PCL to Any Converter Shell is designed to convert PCL (PRN, PXL, SPL and PX3) to PDF, PS, EPS, TIFF, JPEG, PNG, TGA, BMP and PCX. It supports custom page size and resolution. There are two versions for Mac OS X and Linux, respectively. Support various PCL formats including PCL XL, PCL5e, PCL5c, and HP-GL/2 (extensions: PCL, PRN, PXL, and PX3). Support multiple output formats including PDF, PS, EPS, TIFF, JPEG, PNG, TGA, BMP, and PCX. Customize output page size and resolution. Option to set color depth for output files. Option to convert PCL to faxable TIFF image. Support Eastern Europe and Middle Eastern symbol sets. Convert PCL to searchable textual PDF. Convert PCL to faxable TIFF image. Convert multipage PCL to multipage TIFF image. VeryPDF PCL to Any Converter Shell can convert PCL files to PDF, EPS and PS. It also support popular image formats including TIFF, JPEG, PNG, TGA, BMP and PCX. This application can meet requirements of most conversion situations. How to replace and map fonts in PCL to PDF Converter software? This entry was posted in PCL Converter and tagged PCL to image, pcl to jpg, PCL to PDF, pcl to png, PCL to TIF, prn to pdf, pxl to pdf, spool to pdf. Bookmark the permalink.